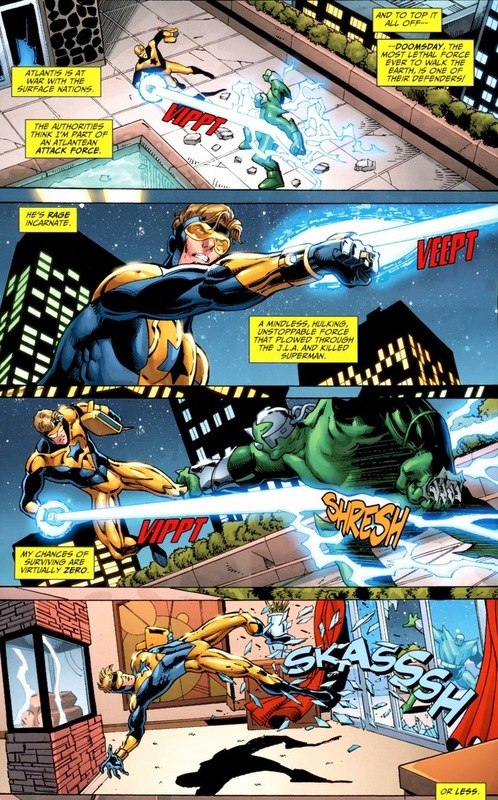 I like Booster Gold, in as much as he’s a jerk turning into a hero story. Premiering in 1986, Michael Jon Carter (living in the 25th century) starred on the Gotham University football team until his father convinced him to throw games. Exposed and ashamed, Carter used a time machine to go back to the 20th century. There, with his advanced technology and knowledge of the future, he exploited the crap out of the situation and become super famous and successful. 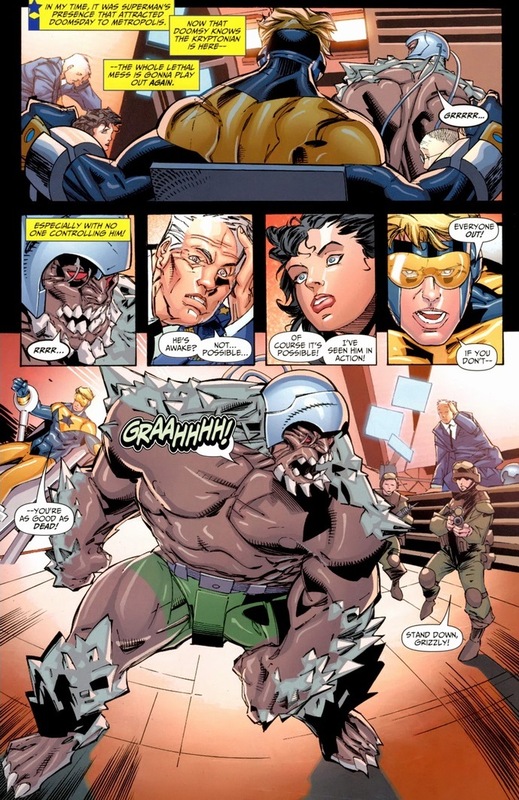 Luckily, over time his jerk-itude faded and he excelled as a delightful and useful addition of the Justice League. 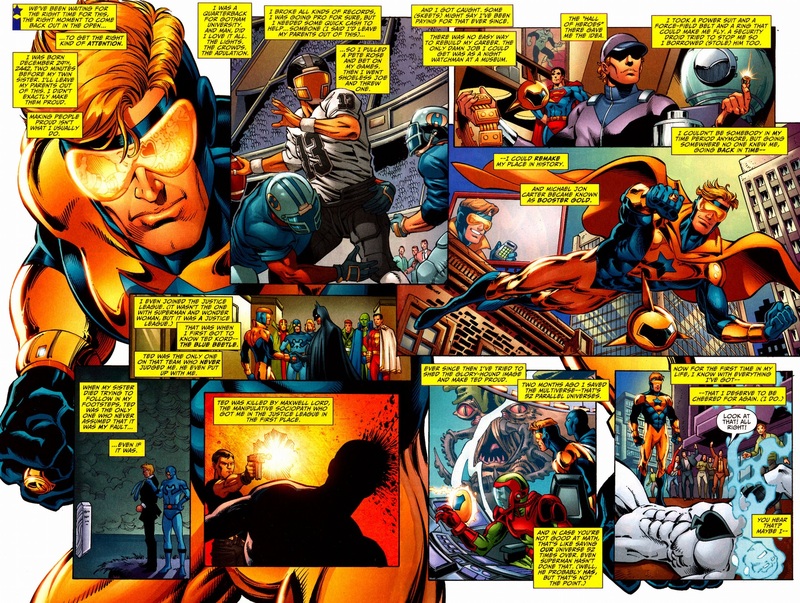 Here’s a more in depth summary from Booster Gold #1, volume 2, written by Geoff Johns & Jeff Katz and drawn by Dan Jurgens & Norm Rapmund. Click the picture for the full-sized version. Mismatched opponents, certainly. Today, we jump ahead to the very beginning of DC’s Flashpoint event — the event that reset the entire DC universe when it ended. 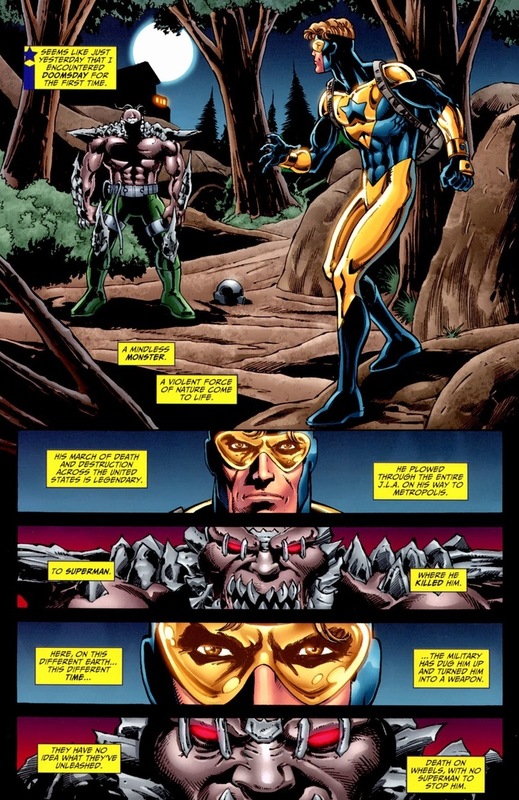 Basically, the Flash’s arch-nemesis Reverse-Flash (actual supervillain name) tried to go back in time, messed some things up, and the entire present changed. How sad. 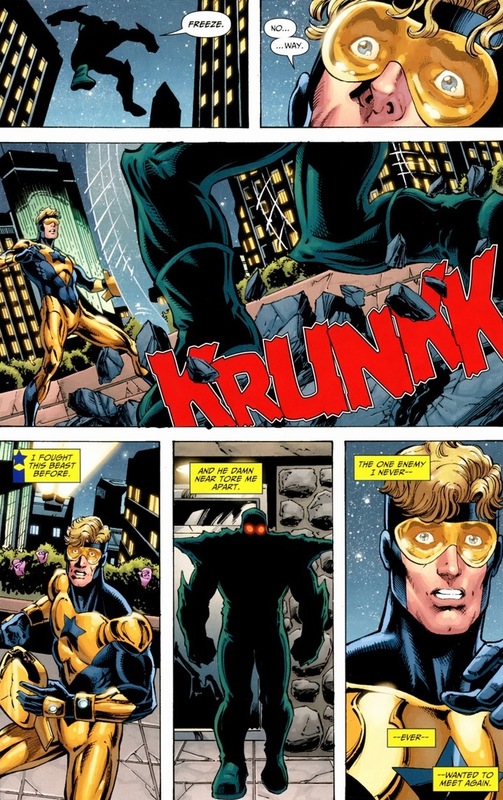 But because of all that time traveling Booster Gold did to exploit the past, he just sort of got thrown in the new universe instead of being “tweaked.” In Booster Gold #44-47, written by Jurgens and drawn by Rapmund, Ig Guara, Don Ho, Rick Leonardi, and Jurgens himself, our hero awakens to one serious problem. Starts with D and ends with -oomsday. 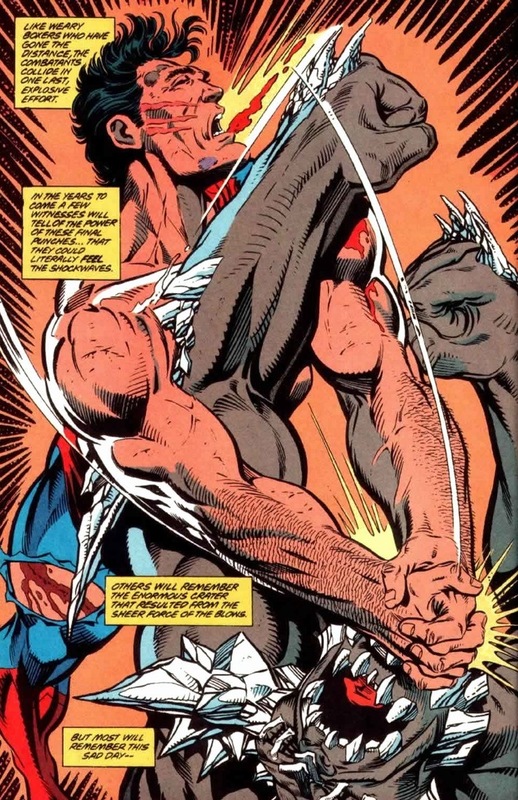 The first bout goes about as you expect when Superman’s killer fights a dude who can shoot lasers. Oh yeah, so the government found a way to control the monster with that nifty helmet. 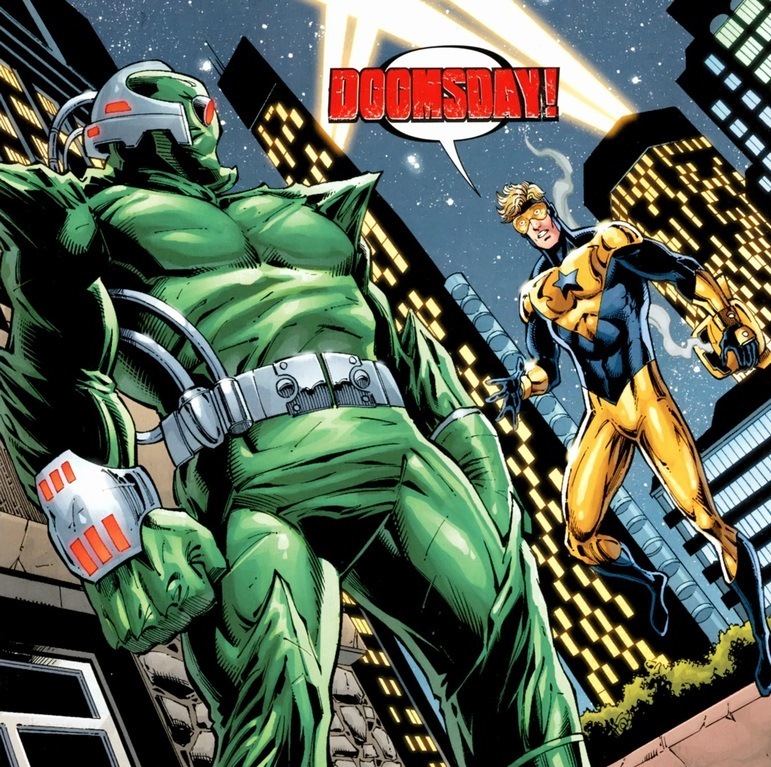 Think of Doomsday as a remote controlled tank, just completely unbeatable. 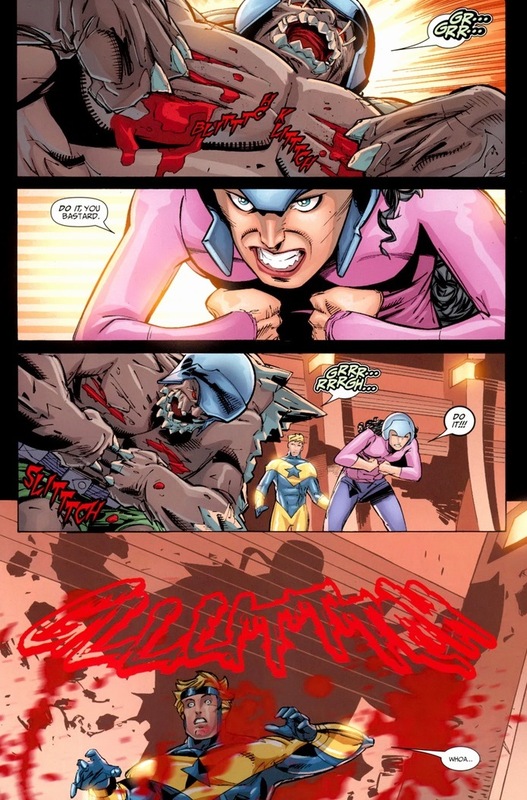 More importantly, what sort of superhero story would this be without a civilian to save? That’s what makes superheroes superheroic. Round two begins, but this time with more conviction. That’s full strength. 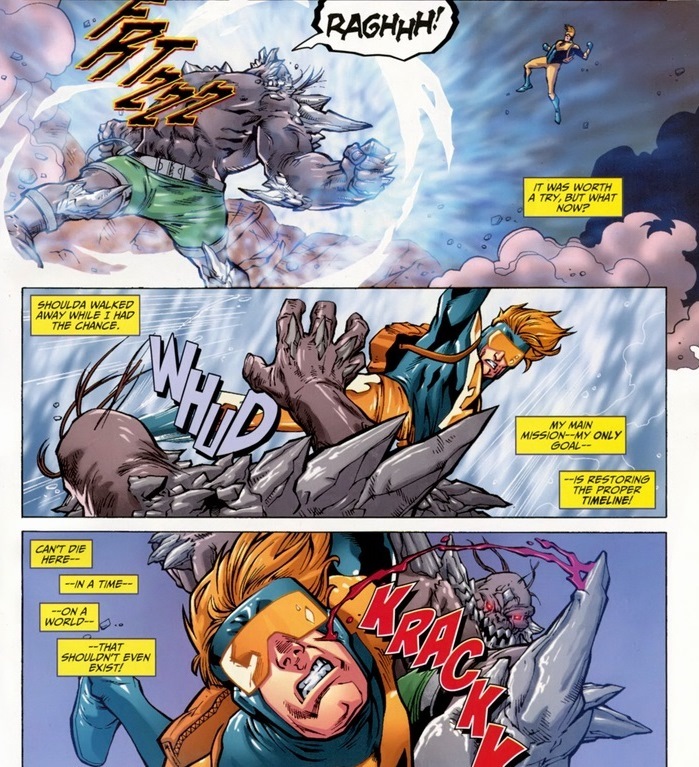 Booster Gold unleashes his strongest, deadliest blast — the one saved for final stand stuff — to put down this beast once and for all. 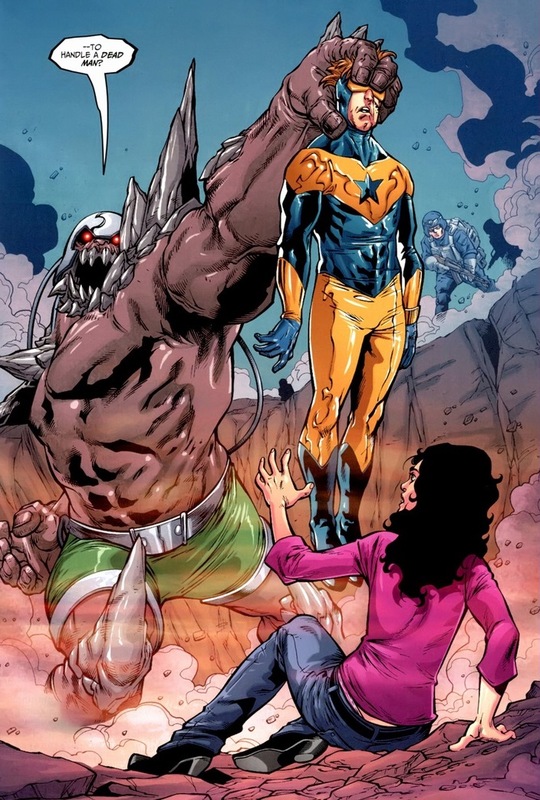 Doomsday suffers the future’s most lethal attack. The end. Or not. 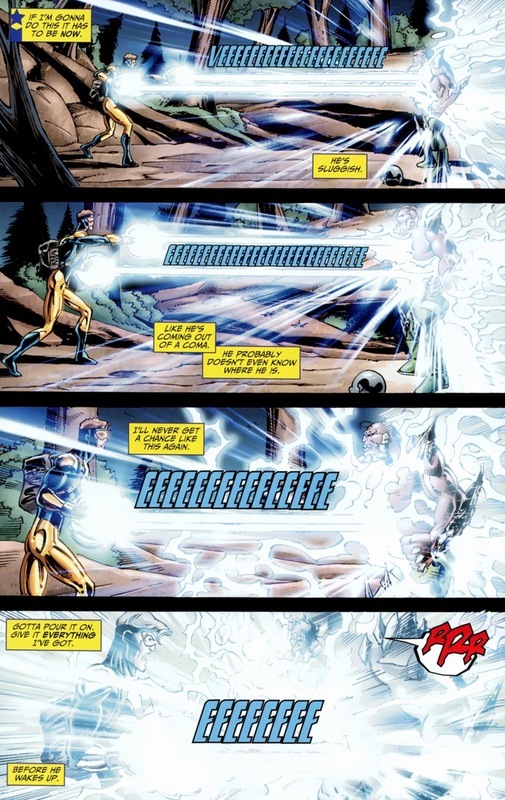 Y’see, Doomsday prime objective still remains to slaughter Superman. Except no Superman exists in the Flashpoint world. 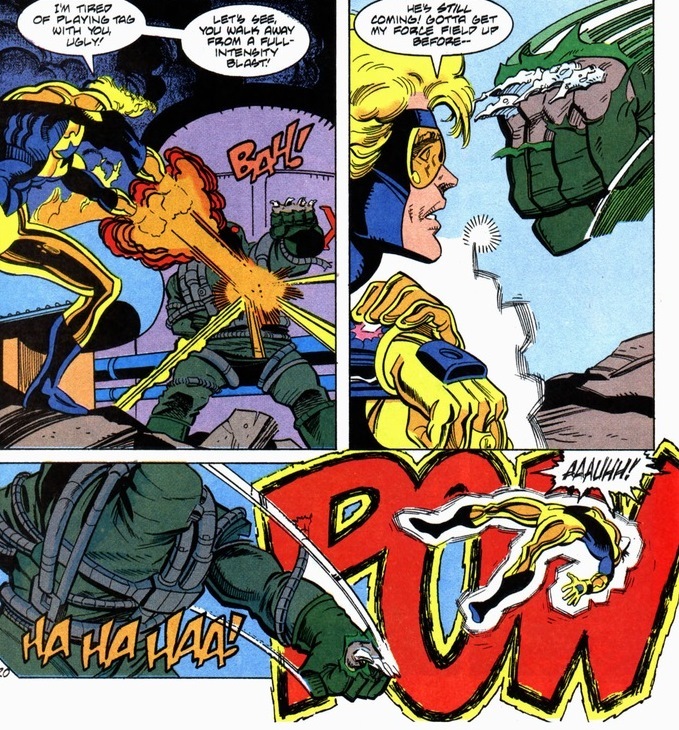 So as Booster Gold escapes death while Doomsday marches on to worthier foes, the poor guy has to jump back into the battle. Protecting Metropolis’ helpless or whatever. 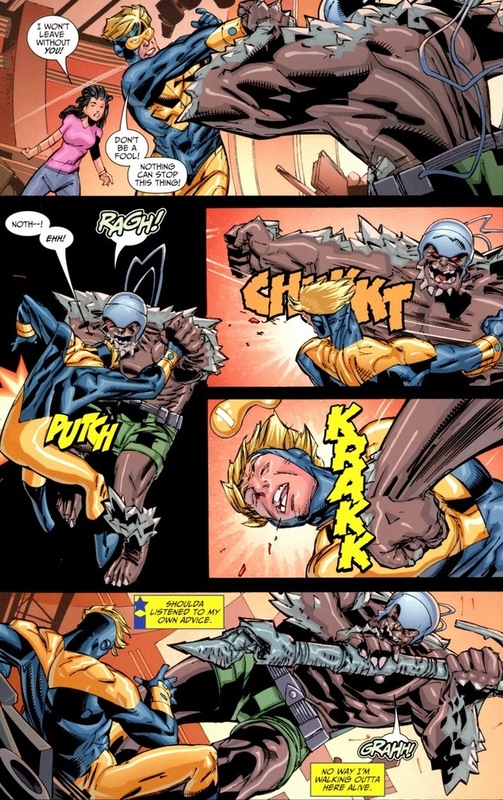 Now, that’s how Booster Gold should have fought this match. 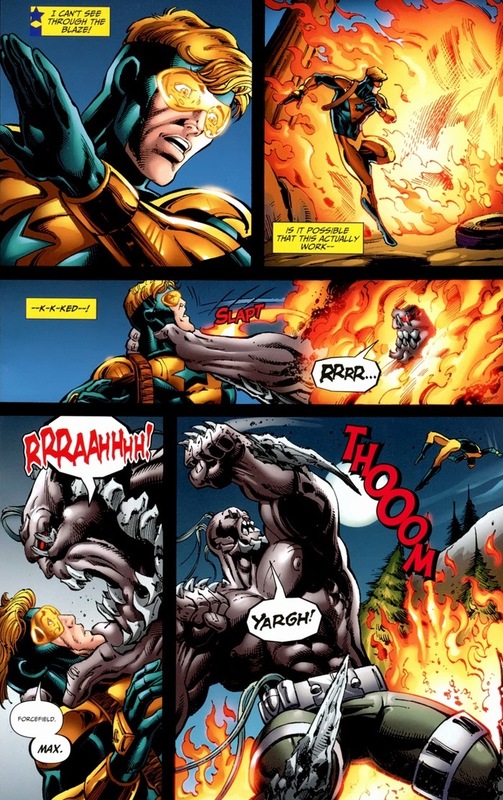 Superman made the mistake of going blow-to-blow with the monster, and Booster Gold has the punching power of a normal guy in his 30s. Brains over brawn, as comic books prove time and time again. 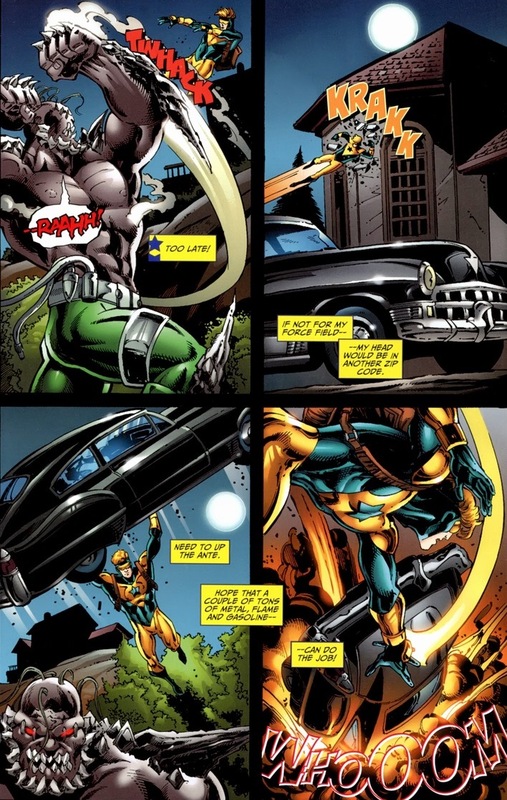 Round two ends with a solid loss for dear Booster Gold. 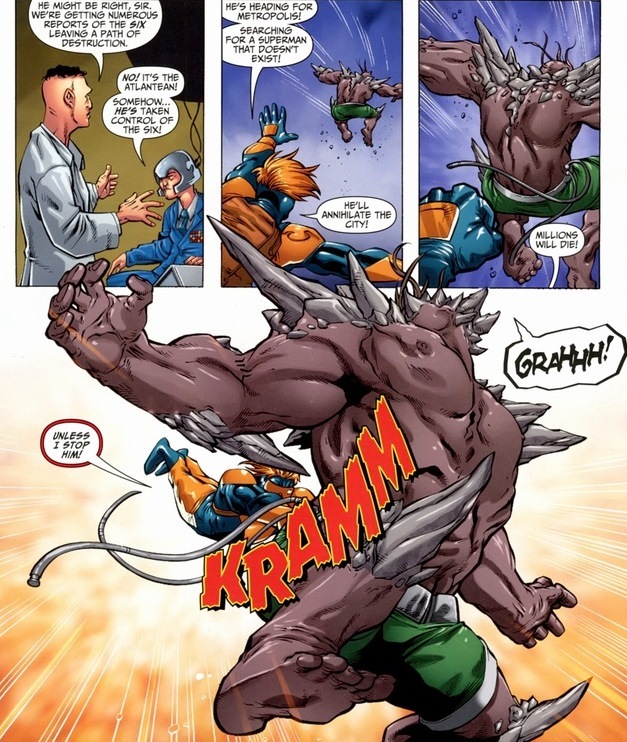 But that whole smarts stuff could still be useful, especially since the monster’s pretty much invulnerable. 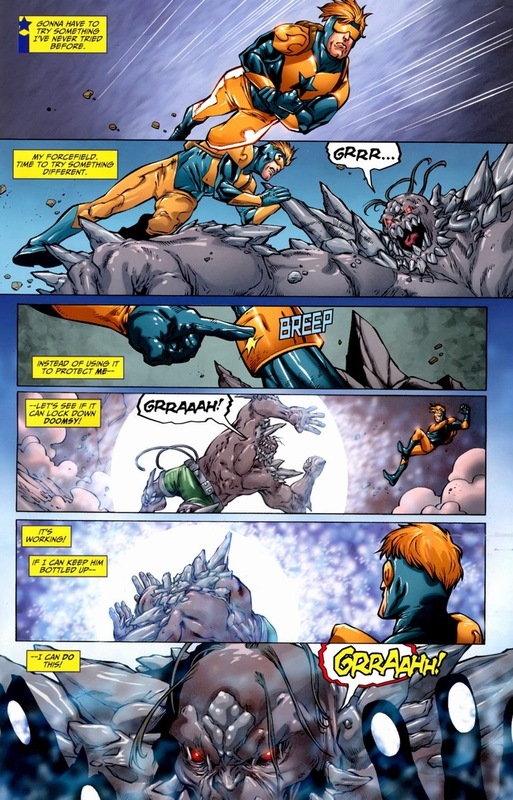 I know this looks bad, but Booster Gold also decided to continue punching Doomsday, the supervillain who shrugs off Kryptonian assaults. 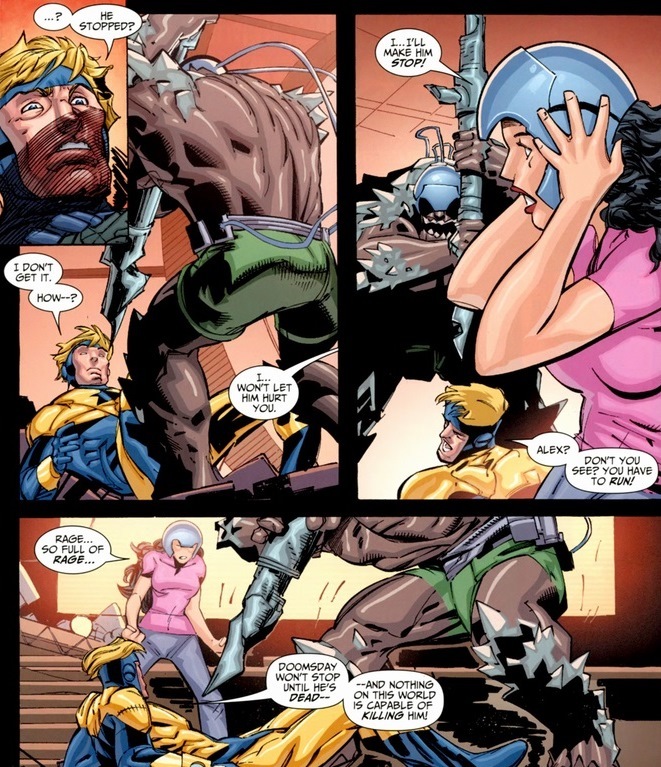 Finally, and seconds away from Booster Gold’s untimely death, his female companion utilizes a good idea. With her brain. 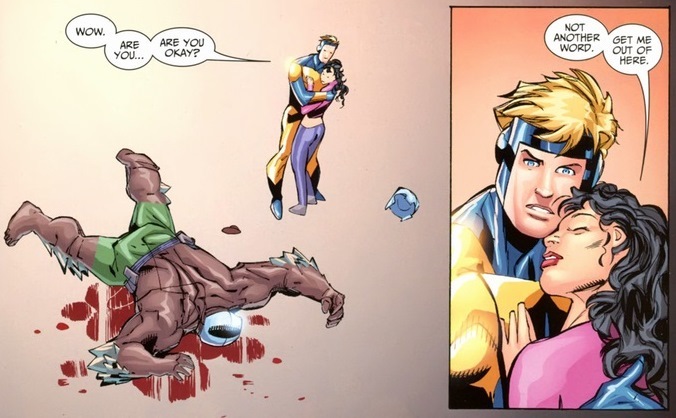 Like Booster Gold should have done. I admire the ingenuity of this next part, as bloody as it will be. 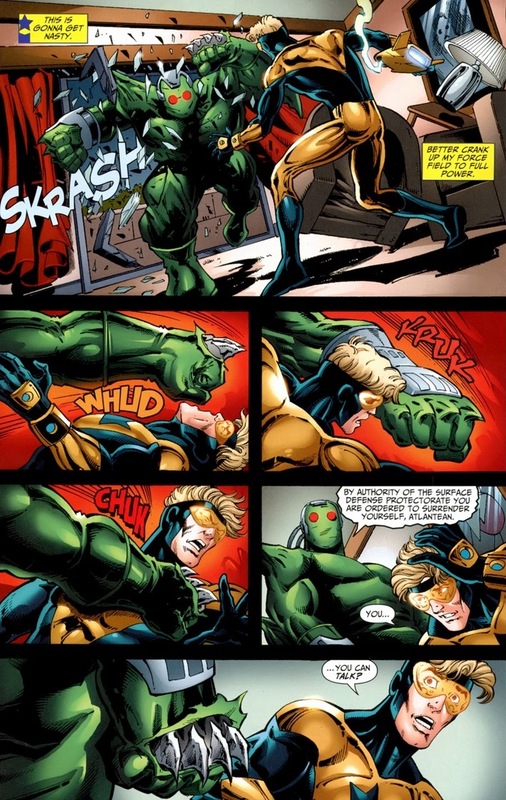 Look, nothing the woman can possibly hit, smack, or throw at Doomsday will have any effect. He can survive in space, sustain any temperature, endure any sort of fall or impact, etc. So how do you kill an unstoppable killing machine? Obviously, you have to use an unstoppable killing machine. Have you ever seen a creature violently rip itself apart through mind control? 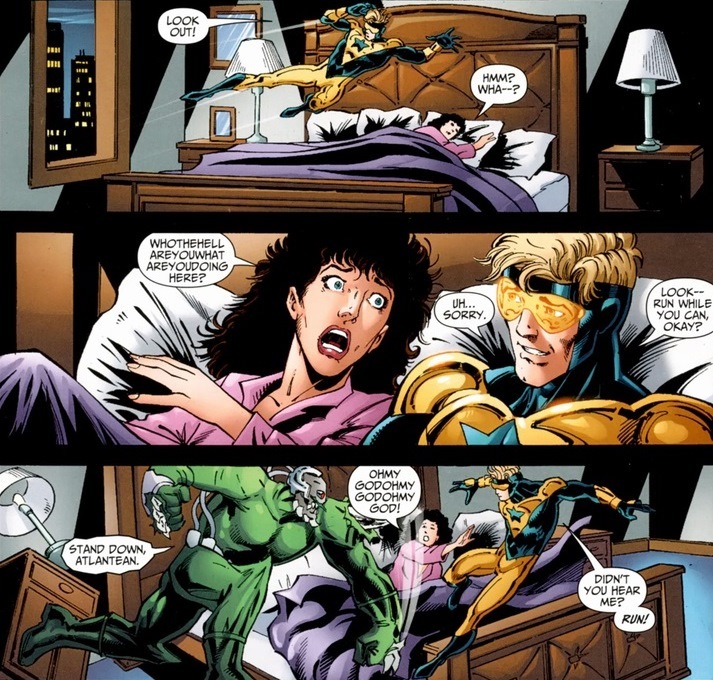 Booster Gold has. And this story gets my favorite literary device: a happy ending. Well, if I end here, it’s a happy ending — the next fifteen pages not so much. 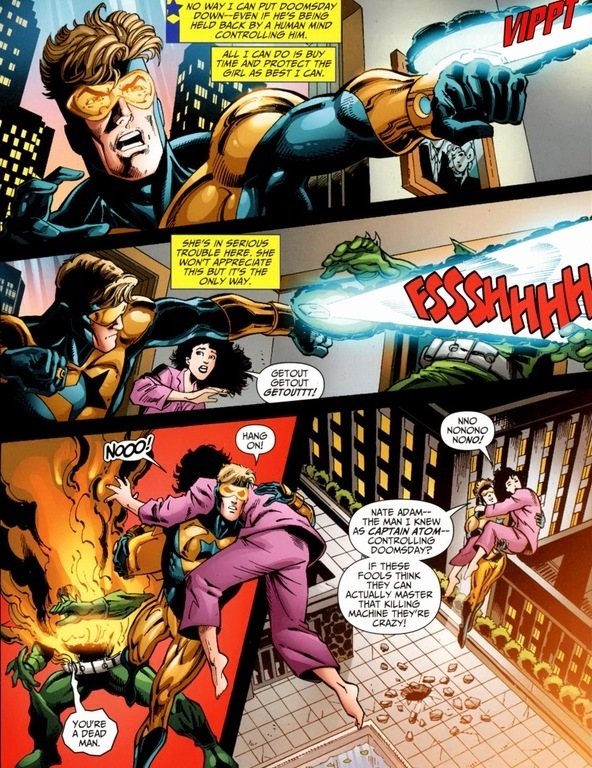 Still, victory for Booster Gold. I mean, he did some of the work.